Some regular readers will recognize Jayson Lusk's name as I link to his website from time-to-time. To preface ... I've known Jayson for over 10 years. As a grad student who was using experimental auctions for his dissertation, I was told by a colleague to call Jayson about an experimental design issue. Not only was he very helpful and kind to a grad student (from a different university), but we even figured out a project on which we could collaborate. Over the years, we've had a few papers together. I've been the main beneficiary of our relationship, as Jayson is one of the most prolific and skilled agricultural economists you'll find, and might be the most-cited agricultural economist of the past decade. When I heard he had a book coming out, I was curious. 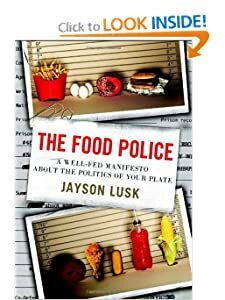 I was pleasantly surprised to hear the title of the book, and I thought he would do a thorough and scholarly job discussing the many restrictions advocated for by the food police. I wasn't wrong. This book is amazing at how it thoroughly describes the how the food police screw things up, increase costs, hurt the environment, and ultimately, cost us freedom. Page 70: "Here is the irony. The behavioral economists have told us for years that humans make mistakes by exaggerating the importance of low-probability risks. Yet I have not seen a single behavioral economist use this insight to tell the food police to relax and put their fears about growth hormones, genetically modified food, or pesticide into perspective"
Page 148: "If we really wanted to curb fat through taxes ... it would probably be more efficient to tax fat people than fat food. ... I have yet to see a compelling argument why taxing fatty foods is any more righteous than taxing fatty folk." When discussing why just saying "eat local foods" to improve the environment could be counterproductive, on page 168: "Of all the global warming impacts that are said to come from food consumption, only 10 percent is due to transportation, whereas 80 percent is a result of activities on the farm. The implication for those worried about global warming is clear: to reduce the carbon impacts from food consumption, one should grow food on farms where production is more efficient and then ship it to the consumer." Are there negatives to the book? Yes, but not many. The tone, at times, is a bit non-academic and overly confrontational. (There's a recipe in there that I think is a bit over-the-top.) This is a relatively minor concern, however. Everybody should read this book. Anybody upset with The Food Police will gain from it, as it will help give an economic foundation to why many of the activities the food police are advocating are wrong. You will find it both enjoyable and educational. Anybody who's initial bias is to restrict food consumption choices, i.e., you are the food police -- I hope you have the courage to read this book to at least understand the other side of the argument. Who knows, maybe you'll even change your opinion!